You've got to admire gardeners, doctors, and anyone else whose jobs involve some type of waiting. Greenskeepers get everything just so, then they wait for growth. Doctors do their thing, then wait for the healing to happen. I suppose that chefs need to let things bake, that NASCAR crew chiefs need to wait for laps to pass before the next pit stop, and that parents sometimes just have to let events occur without conrolling it all. Waiting is a part of it--a very healthy part of it all. When I look at the school's calendar, I see a series of events that have yet to occur. I look at the big picture and see a large Rube Goldberg machine that needs to be left to do it's thing. It's not for me to micro-manage, it's not for me to get in the way of. My teachers know what they're doing; the students know what is expected of them; the events are planned and waiting to be executed. At some point, I'm comfortable sitting back and watching the whole thing happen. I step in only when necessary, and as it unfolds I'm in the background, like a movie director--never on camera, but watching it unfold and stepping in to tweak it as necessary. When the school principal sees the school calendar, she sees a big toy to play with. She throws it around, moves it this way and that, and tries to change it for maximum efficiency. It's like a prototype car that never gets into production because it's too busy being played with, changed, and modified. It's a game of Tetris, where all the little spaces need to be filled. It's never done, and keeps having to stop so that someone can do something else to it. It never gets its momentum. It never gets a chance to perform. As we get closer to the end of the school year, this is still happening. With the STAR tests looming (followed by two weeks of AP tests), there are still things being added to the calendar. There's an assembly on dating abuse; there's another college night; now there's a barbecue to celebrate a CDS honor nobody really cared about to begin with. There's always something being added to the calendar as an "event." What seems to be missing is the realization that on a day when there are no "events," classes are being taught. With all the special events--some taking away from class time teachers and students desperately need as we come closer and closer to final exams--it's a wonder that our test scores, API, and college entrance rates are as good as they are. I have a favorite saying these days when people ask me what's been going on at work. I list off a few of the "events," and I end it with " . . . and occasionally, when there's time, we teach some classes." *Another movie reference. If you didn't make the mistake of seeing Executive Decision, this line is uttered twice to Kurt Russell as he frantically tries to figure out what he has forgotten to do in the cockpit, only to reminded that there is nothing left to do. As an Assistant Principal, there are duties that I am bound to perform in accordance with my job description. I don't know how it is in other professions, but in education the "job description" is totally malleable, extremely porous, and pliable to the point of collapse. If you add to it that I work at a 7th-12th grade campus but hold the title of Middle School Assistant Principal, my job description becomes even more nebulous. Either there are too many tasks for the current administration's size, or too much is being given to me because others are unable or unwilling to accomplish the tasks. Moreover, I suspect that duties are being assigned not to the office, but to the person in it, and I think that's the wrong way to go about doing it. And I'm getting a little sick and tired of being the only guy who can stand the heat in the kitchen. Is This What Being "Off Warranty" Feels Like? One of my teacher friends made an interesting comment about the goings-on at my school of late (his blog comment is around here somewhere . . ). He said that he still felt like toughing it out, but I may be looking at it from a perspective he can't see ("as my office isn't as close to ground zero as yours is"). If he only knew what it looked like. Our School Needs A Shot In The Arm? How About Twelve In The Stomach? It amazes me sometimes what people will react to. On the Friday before Spring Break, a sick bat was found near the PE locker rooms. Animal Control was called, picked it up, made sure that no one had touched it. Just another day at the office. I didn't really think it was a big deal, and here's why: no one had called me when it was found, no one alerted me to the situation after Animal Control was called, and I only found out about it because I stopped the officer as he was leaving the building. He said that they would test it for rabies, since a rabid bat had been found on the other side of the county late last year (by the way, rabies occurs in one tenth of one percent of bats). 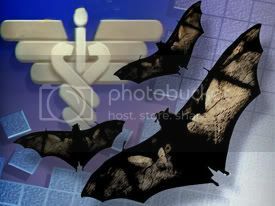 Within twenty four hours, the Director of Health Services for the county has been in meeting after meeting about the bat, every news service in the area is running the story (how did I find out the bat tested positive? The L.A. Times), and I've got over twenty direct Google hits about our sick little friend. The district office goes on full alert, and sends out every message it can to all the people NOT connected to our communication infrastucture (does anyone e-mail or call the school's PR guy? Nooooooo. My cell phone, my work phone, my e-mail . . . nothing bat-related). I've got massive student attendance problems, rampant campus-wide theft, three drug investigations pending, and teachers threatening a work-action and everyone is focusing on a sick chiropteran that nobody touched. The things we choose to care about. The people at my school are displeased. I should know--I'm one of them. The five of you that read this blog are by now well aware of my distaste for the recent goings-on of my campus. Where I might once have spent as much as half my Spring Break in the office getting caught up (or even ahead!) of things, I have NO interest or motivation to come in to the office this week, and have brought home only a small box of stuff to work on, all of which can be done from home on the computer. My office was once a place that I felt comfortable in, a place that I could truly call a home away from home. Now I'm like all those comic strip characters who keep their heads down in the hopes that no eye contact is made with "the boss." I've read blogs kept by teachers at my school who are just as unhappy, both with the district for the salary woes and the school for the direction in which it is (or isn't?) going. I haven't even touched the box, by the way. I was recently reminded of a bit of carnival schtick I haven't seen in a while: a man stands behind a rack of eight or ten thin vertical poles, each about six feet in the air, and spins plates atop each one. As they slow, he must either speed them up or replace them after they have fallen to the floor and shattered. No one complains about the shards on the ground; it's a comedy routine, and the broken plates add to the mayhem. The whole thing that makes it funny is that one person is trying to do way too much all at once. It's not funny, however, when it's the metaphor for my school. The powers-that-seem-to-be have asked me to schedule yet another last-minute assembly for students that, while interesting and relevant to be sure, we don't really have time for. We're going to be piled up with testing for three weeks straight, then getting ready for finals at the end. There aren't many free days, and we're already to the point where the span between special programs is sometimes a day or two (or, in one case, two hours). WE ARE TRYING TO DO TOO MUCH, and I fear it will take a very ugly toll on the students and staff. My opinion is hardly even solicited anymore, for everyone knows my answer will be that we are spreading ourselves too thin. Years and years ago, I would root for the guy with the sticks. These days, I find myself far too concerned with the plates, and I don't like feeling that way.